This seriously scares me in Pirate Warrior. ohhh now boom makes sense.. wow so much face dmg.. 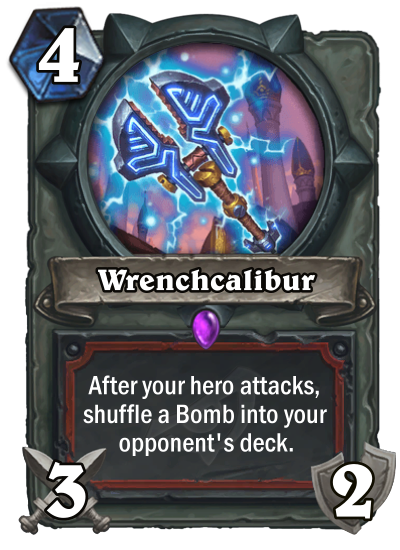 I loved playing Seaforium Bomber and I will love playing Bomb Warrior. Wrench + Goblin + Dr. 7 ..! The mindset that I wish more people would have when cards get revealed. Not until everything gets revealed can we kinda see what could be really strong. I'm calling it now, control bomb warrior is going to be a really good tier 2, if not tier 1 deck. They can just endlessly shuffle bombs into your deck while removing all your threats and playing seriously defensive. This much potential damage can't be overlooked, but it might be hard to get your opponent to draw the bombs if you are playing an aggro deck. You'd want to close out the game before the chances of drawing a bomb is high enough to matter. This weapon is just funny as hell. I am not sure if it will be good but it will be funny to add more bombs into the opponent's deck. "when drawn deal 5 damage to the player and draw another card"
Well, this is a counter for Heistbaron Togwaggle + Wondrous Wand shenanigans I guess. Still not sold on putting bombs in the opponent's deck as a real viable strategy, but cool to have a new archetype. This card seems realllly slow, aggro would eat this deck for lunch. Axecalibur would've been a cooler name. We are going to see alot of ooze techs this expansion. I don't see this being weak to aggro necessarily because Warrior already has on tempo plays that are rather good. If anything you need better miracle turns to beat this as aggro. I really hope this archetype fails hard, because it would be the most frustrating thing to play against. Like playing against Aggro? How about Aggro that kills you with damage you can't even prevent. You like to play combo? Well screw you for trying to play your deck the way it's intended to be? don't have any healing in your class? Have fun with an unwinnable match up.